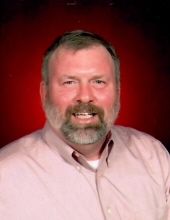 David Lund Chelsen, 60, passed away on February 10, 2019, peacefully in his sleep after a nearly 4 year battle with cancer. David was born May 14, 1958 in Fosston, MN, to Pastor Ralph and Eleanor Chelsen. In 1960, they moved to Lisbon where Pastor Chelsen served until his death in 1981. As a "busy" two year old it didn't take David long to make himself known to everyone in Lisbon. Some called him the "social director". He knew everyone's homes inside and out. As a young man he developed his love for the farm, mechanical things and hard work. David started a lawn mowing business and did most of the lawns in Lisbon. He also worked for many farmers baling hay or walking beans. In high school he got a job milking cows for Art Nagel before and after school to make money to support his love of cars and to take Lori out on dates. David bought and sold so many cars that the woman at the Grundy Bank knew the minute he walked in what he was there for and would say, "What did you get now?". David attended Newark High School and graduated in 1976. He also attended Joliet Junior College for two years for Automotive Repair and later was employed by United Auto Center in Aurora. David was united in marriage to Lori Vogen on September 30, 1978. For many years David also worked at night in a little two car garage to make extra money so Lori could stay home and raise their three children. He later officially opened Dave's Auto in the shed behind his house which he ran with his son Jacob. Who had been running the shop while David had been ill. He also loved to have his yard looking like a park and had pots of flowers everywhere and enjoyed his grandchildren and the company of many friends. David worked a lot but when he did find time to take a vacation it was always to Walt Disney World or Disneyland. He loved the special tours they offered and, of course, the food. Always had a Hawaiian shirt to wear even though he never got there. He is survived by his wife of 40 years, Lori, his three children, Katie (Tim) Blanchard of Newark, Adam (Katie) Chelsen of Sheridan, and Jacob (Jen) Chelsen of Lisbon. Grandchildren, Timmy and Zeke Blanchard, Ruby, Jack, Ellie, Carter and Everly Chelsen. His mother Eleanor Chelsen and his siblings Mark (Jeanne) Chelsen, Paul (Laura) Chelsen, Ruth Ann (Ray) Collings, and Miriane (Rick) Tollefson, and many nieces and nephews. He was preceded in death by his father, Ralph Chelsen and, his in laws, Russell and Vivian Vogen. Special thank you to all of the staff at the Northwestern Cancer Center in Warrenville, and Dr. Kevin Dawravoo and Dr. Erik Englehart. We have appreciated all of the prayers and encouragement through this long battle. Gathering of Family and friends will be held at Helmar Lutheran Church, in the Family Life Center, 11935 Lisbon Road, Newark, from 3:00 to 8:00PM, on Friday, February 15, 2019. Memorial service will be held at 11:00AM on Saturday February 16, 2019, at the Helmar Lutheran. Pastor Steven Lombardo will officiate. Interment is private at a later date. In lieu of flowers, memorials may be directed toward the Helmar Food Pantry or the Helmar Mission Fund, 11935 Lisbon Road, Newark, IL 60541. To send flowers or a remembrance gift to the family of David Lund Chelsen, please visit our Tribute Store. "Email Address" would like to share the life celebration of David Lund Chelsen. Click on the "link" to go to share a favorite memory or leave a condolence message for the family.